Today is 10/10/10. What does it mean? For most of us, another day. For some, the numbers hold meaning. The number ten has religious and spiritual significance. Many regard it as the most perfect of numbers, because "it contains the Unit that did it all, and the zero, symbol of the matter and the Chaos, of which all came out; it then includes in its figure the created and the non-created, the beginning and the end, the power and the force, the life and the nothing." To Mayans, it represented the end of a cycle and the beginning of another. They viewed the number ten as the number of the life and the death. Others say it’s a number representing totality, the achievement, the return after the cycle of the first nine numbers. Many believe the ninth month brings everything to a conclusion. Both the good and bad aspects of the year reach a peak at that time. Especially during 2010, it begins a new nine year cycle. The zeros signify unborn potential; think of it as an egg. Someone online said because this year has been stretching in so many ways, the best results will come from work, play and rest in equal measure. 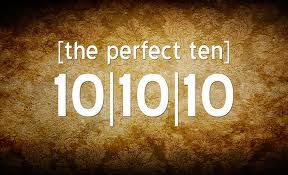 In general, the number ten represents: "Positively, a change in fortune for the better, either monetarily or otherwise. A new step forward on the path of tomorrow. Your destiny. Luck. Old knowledge, especially esoteric or religious, from books. Old souls. Connection with the Star signs of Leo, Taurus, Scorpio and Aquarius. Good ventures with those signs in mind. Being in the right place at the right time to grasp opportunities. Negatively, inescapable destiny, which is not necessarily fortuitous. Being in the wrong place at the wrong time. However, the positive is mainly or usually the case in connection with the number 10." Sounds good to me. I'm all about the positive. Hope you all get a positive charge today! Today is my 35th wedding anniversary and I deliberately chose this day knowing someday I'd see it with my better half. How wonderful! Happy 35th to you. Hope it's your most memorable yet. Here's wishing you a postive charge, too, Cate. Thanks! The same to you, John! I love the power of 10 :). Wishing you positive energy, good fortune, and a blessed day Cate. Great post :). Hey Cate, I'd forgotten the date. I thought about it earlier in the week but I've been so busy today that it slipped my mind. Thanks for reminding me. Change for the positive is something I believe everyone is looking forward to. Hope your next 9 years are great!